There is nothing that I love more then a mouthwatering salad. One that tastes so amazing that you crave it and can’t wait to make it again. This salad was just that. One of the best ones that I have had and it is screaming fall! 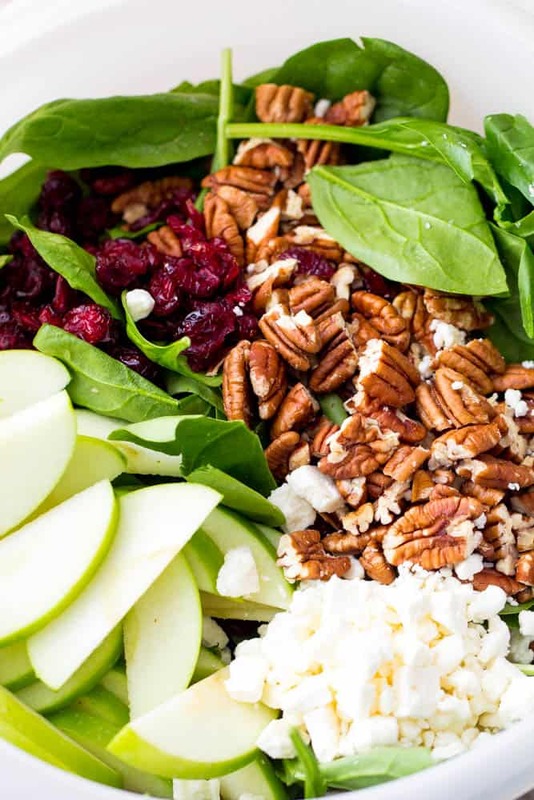 The line up of this salad is all of my favorite things about fall. Dried Cranberries, pecans, apples, and feta cheese. 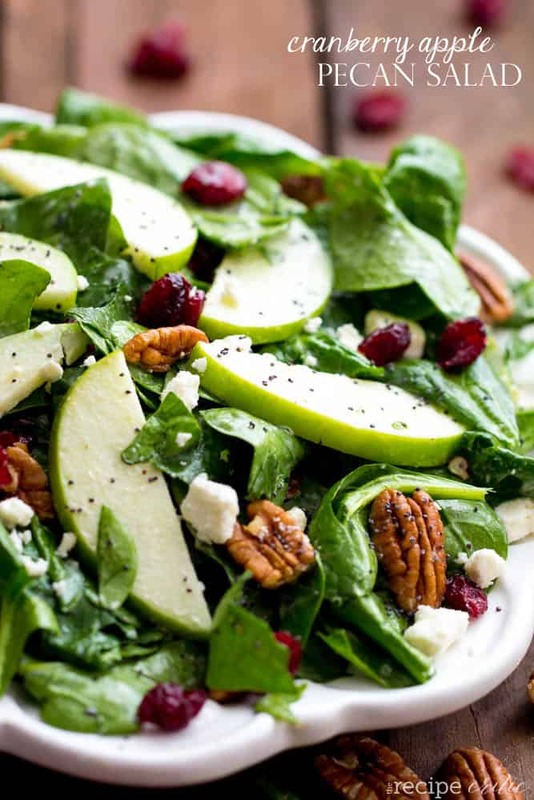 Toss with some fresh spinach and you have one amazing salad. I used my favorite creamy poppyseed dressing from this Strawberry Avocado Salad. It is seriously the best dressing I have ever had. It glazes the salad perfectly. I am afraid of using anything else because everyone always raves how amazing it is. It complemented the salad perfectly and all of the flavors came together so amazing! I just couldn’t get enough of this salad. Make it for yourself and see how incredible it is! This is truly a 5 star salad! An amazing fall salad with the best creamy poppyseed dressing that you will ever have! 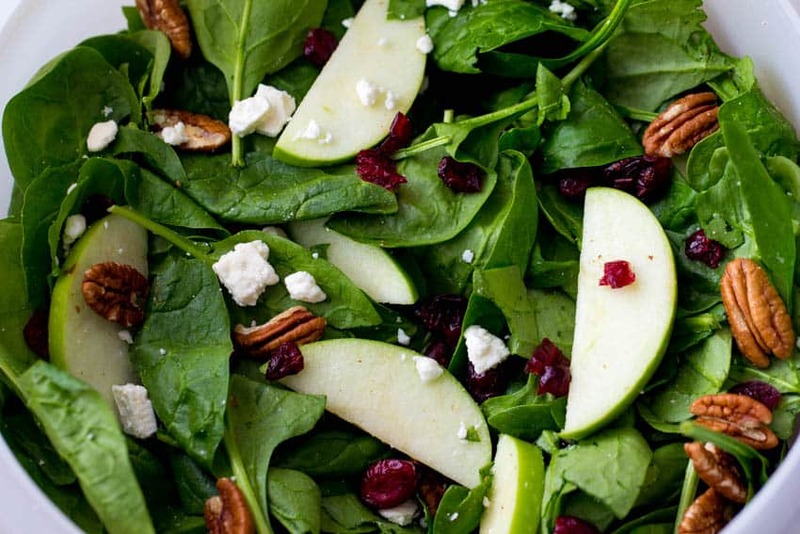 In a large bowl, toss baby spinach, pecans, apples, feta cheese, and cranberries. In a small bowl, whisk together the mayonnaise, milk, sugar, cider vinegar, and poppyseeds. Pour over the salad and toss to coat. Serve salad immediately and garnish with more feta cheese if desired. That’s a delightful salad and that dressing is calling my name. I adore dried cranberries on a salad. This dressing sounds fantastic!! This is my idea of good food. Do you think this salad would take just as good using spring mix lettuce??? I think it would be great with whatever you prefer! I’ll try to put this to good use immeyiateld. We are loving this salad! I’ve been making it about once a week recently. I have been using the apples we have on hand even though the Granny Smiths would be delicious. Thank you for your wonderful recipes and the time you put into your blog. I am wanting to make this salad for my son’s wedding reception. There are roughly 70 guests. Can you give me an idea on how the best way to calculate the amount of dressing I would need to make. And what would be the best way to preserve the apples for about 2 hrs to keep them from turning? Thanks for any advice you could give. Made this salad to go with our Thanksgiving dinner. It was EXCELLENT! I did skip the feta this time but with another menu, I’ll add it. I will be making this regularly. Thank you, Alyssa! This salad was amazing!! We added some bacon for another layer of flavor and used spring mix. There were 2 of us fighting over the last bit of it in the bowl. SO GOOD!! Definitely a keeper.